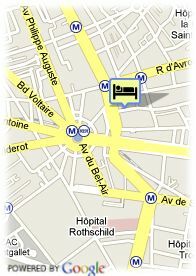 13 Boulevard de Charonne, 75011 Paris, Frankreich. 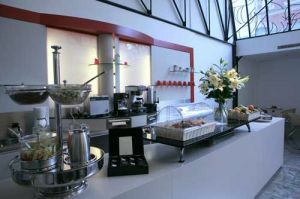 The Pavillon Nation, ideally located close to the Nation métro station, enables you to join easily the main business districs and most of the major attractions in Paris, including also Disneyland Paris. A contemporary decoration which does not miss softness, as royal red, tone heats, enlightened of white furniture and especially and absolute confort with silence of a peaceful district. It offers 43 well-equipped rooms with air conditioning, heating, telephone, TV, cable TV, safety deposit box etc. Bezahltes öffentliche Parkplätze in der Nähe des Hotels (überdachte) (25.00 €). in der Nähe der U-Bahn / Strassenbahn.